I learned about Simalakamma for the first time by reading their blog a year ago. I was awestruck by their complementary closing for every blogpost: “Hugs, Kisses, and Weird Stares”. Suddenly the faces of the Simalakamma girls flashed before my eyes and I grasp, thinking of how they do have a slightly weird stare.. in a good way, of course. You know this curious gossipy look with a hint of surprise and shock-freeze that sometime seen in the eyes of a cat under the flashlight? Yes, think of the eyes of a deer in front of car light and add a slight extra awkwardness and you probably have a hint. The first two words of their complimentary closing “hugs and kisses” are typical sweet girly kind of warm closure; adding the last “weird stare” shows their quirky personality. The combination of sweet, girly, and quirky embodied in them and their works. Thanks to the new trend created by the independent magazine of Lula from England and Frankie from Australia, this down to earth persona is highly favorable nowadays. These girls touched my heart eversince, and gained a loyal reader of their blog. It’s always amusing to read and I always curious of what they will write next. Soon I found out it was Dina who responsible of all the writings in their blogpost while Elia, quoting from Dina’s writing, had just recently discover her robotic ability to keep making purses, wallets, and producing tons of pancakes. To some, what Dina is doing can be seen as an instinctive marketing strategy of creating branding and personality. In another way, that is just how these Simalakamma girls live their daily life. Speaking of the Simalakamma girls, there are Elia Nurvista and Syafiatudina who work hand-in-hand behind the brand. They both love beautiful things and enjoy the beautiful process of making beautiful wallet with beautiful fabrics. Elia is an artist who chooses to use fabrics and thread as her art medium. She recently finished a residency in Japan creating a lovely food-celebration out of yarn, only to find that she left a piece of her heart in this country where cuteness is cult. Syafiatudina (Dina) is a young researcher who recently finished her study and prepares herself to join the ‘real world’. Elia is responsible to the production and design. It is also her job description to conduct a harmonious orchestra of the agent of senses; or in this case, being a strong thread that weave together all the processes of designing, screen-printing, stitching, engraving, cutting, and sewing. While Dina is responsible for the online branding, sales, and marketing; creating personality of the brand, and write the blog. Her job description includes making dry jokes with a hint of lovable awkwardness. Elia said that Dina wrote “weird stares” as the closure because as a non-social-butterfly, Dina has this habit of giving a weird stare to strangers that make the budding relationship might feel a little bit awkward at first. Somehow, this knowledge sharing of a little detail shows the intimacy and chemistry that bound them together as a group and as a friend; or more likely, a sisterhood. The sisterhood continues; bounded together with thread, fabrics, pattern, touch, smells, gossips, and all the senses. The product of Simalakamma went through a long journey of subtle handcraft and thoughtful design. The whole process and behind the scene of Simalakamma can be traced in this exhibition. When you enter the door, you will be lead to this journey starting from designing, screen-printing, hand embroidery, laser engraving, cutting, and sewing before the product is finally ready for public consumption. The Simalakamma girls know everyone by heart. Their relationship with the ‘agents of senses’ is closely personal, down to their life little details. Take the sewing circle for example; the embroidery process is more than just a job to them. For a group of young art school students who helps making complicated pattern of the embroidery, the sewing circle is how they earn extra money while giggling and sharing each other’s life story. For the lady who just lost his husband, working for Simalakamma is somehow therapeutic and helps her stand on her own once again. And for the office sewing circle, the embroidery process is considered relaxing, gossipy, and inevitably addictive. Elia knows which one of the agents prefers to do which pattern, whether she should give the dark one to the younger group or whether the older one will like it better. She also knows how to deal with the intimidating mother-in-law of the very-timid sewing man who is highly committed to his work. It is only natural for Elia to know everyone by heart because she actually spends her daily routine visiting them right after her morning coffee and online-inspiration search; right before the designing process and her favorite thing to do: fabric mix and match. To me, it is important to lay on some facts and stories of the process to be able to say this: Simalakamma is more than just a product or a brand of handmade purse. It is an art work combined with chanting stories and tender touch, weaved together in every thread. The name, Simalakamma, was chosen due to the unknown-originality of the word. It doesn't belong to any language yet it sounds very familiar. The meaning itself is considered awkward and represents an awkward situation of choices. It seems like there is something about awkwardness that the Simalakamma girls find exciting. Of course, at this point, what they call awkward I might as well refer as quirkiness. At first, their product embodied the concept of upcycling the non-wearable vintage dresses with interesting pattern they found at the thrift store. Soon it expands to new materials and more products of purse, wallet, pouch, tote bag, iPad case, passport case, and even book sleeve. They chose to make this kind of accessories because of the surprises the design could offer (eg: hidden mini SIM-card case inside a purse), and because Elia fell in love with the hand embroidery technique and the possible application is on something that should not be washed that often while maintaining the good looking. In creating this product, Simalakamma were inspired by anything pretty. Colors, fabric patterns, melancholic things, books, outfit someone wears, and things the saw on the street. For them, being in Simalakamma is like being in a relationship. Surely, it was nothing but love that can make Elia so happy just by looking at a stack of fabrics and yarns in her studio, right? In this exhibition we would like to take you to the journey of a purse. Here you can witness the process toward beauty of a piece of leather and fabric sewn together as a unique wearable artwork. 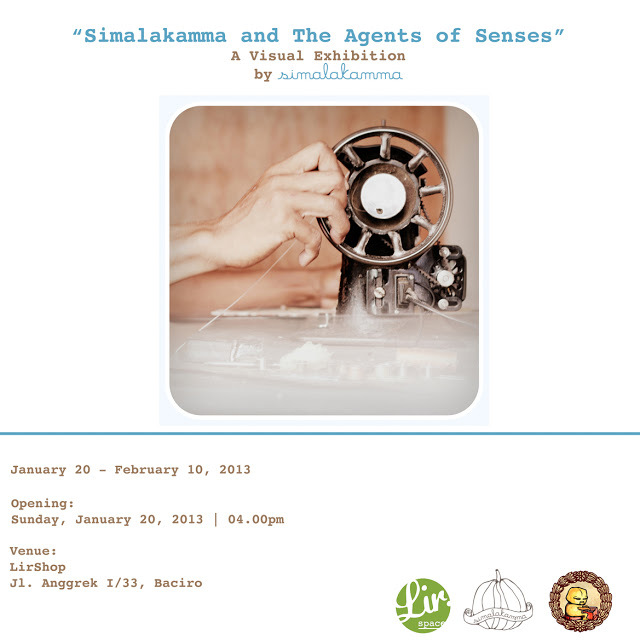 The exhibition is collaboration between Simalakamma and the agents of senses with a photographer, Dito Yuwono. Both the artwork and the exhibitions are the products of fine craftsmanship and dedication. Enjoy the show and as Dina said, don't forget to breath and occasionally laugh! Saya tahu tentang Simalakamma untuk pertama kalinya saat membaca blog mereka setahun yang lalu. Saya begitu takjub dengan cara penyambutan mereka untuk setiap pos: “Peluk, Cium, dan Pandangan yang Aneh”. Kemudian wajah si gadis Simalakamma melintas dan saya terkejut, berpikir bagaimana mereka bisa memiliki cara pandang yang agak aneh.. maksud saya dalam kesan yang baik. Anda tahu tatapan penasaran dengan kesan terkejut dan syok berat yang kadang terlihat pada mata kucing saat ada kilatan cahaya? Ya, coba pikir tentang mata rusa di depan sinar lampu mobil dan ditambah sedikit kecanggungan dan yaa, mungkin saja Anda mendapat petunjuknya. Kedua kata pertama dari sambutan penutup mereka “peluk dan cium” merupakan kata penutup hangat semacam gadis kecil yang manis; ditambah akhiran “tatapan yang aneh” menunjukkan kepribadian mereka yang unik. Kombinasi kesan manis, feminin, dan unik menjelma pada mereka dan pekerjaan mereka. Terima kasih atas tren baru yang terbentuk oleh majalah mandiri oleh Lula dari Inggris dan Frankie dari Australia, kepribadian yang rendah hati sangat mulia saat ini. Kedua gadis ini menyentyh hatiku, dan menjadikanku seorang pembaca setia blog mereka. Membaca blog mereka begitu menakjubkan dan saya selalu penasaran akan apa yang mereka tulis selanjutnya. Kemudian, saya mengetahui bahwa ialah Dina yang bertanggung jawab atas seluruh tulisan di blog mereka, sementara Elia, mengutip tulisan Dina, baru saja belakangan ini menemukan kemampuan tersembunyinya untuk selalu membuat tas, dompet, dan membuat kue-kue pancake. Untuk sebagian orang, apa yang Dina kerjakan dapat dilihat sebagai strategi pemasaran naluriah dengan menciptakan brand dan kepribadian. Dengan kata lain demikianlah cara gadis Simalakamma mengarungi kehidupannya. Berbicara tentang si gadis Simalakamma, merekalah Elia Nurvista dan Syafiatudina yang bekerja sama di balik merk ini. Keduanya menyukai hal-hal yang indah dan menikmati proses yang cantik saat membuat dompet cantik dengan kain yang juga cantik. Elia adalah seorang seniman yang memilih kain dan benang sebagai media seninya. Dia belakangan ini menyelesaikan sebuah keresidenan di Jepang dengan menenun gambar festival makanan yang cantik, hanya untuk memastikan bahwa ia meninggalkan sepotong hatinya di negara itu di mana kecantikan menyertai setiap kehidupan. Syaifatudina (Dina) adalah seorang peneliti muda yang baru-baru ini menyelesaikan masa studinya dan menyiapkan diri untuk bergabung dengan ‘dinia nyata’. Elia bertanggung jawab atas produksi dan desain. Dia juga mempunyai tugas untuk menyelaraskan orkestra si agen pemakna; atau dalam hal ini, menjadi sebuah jarum yang kuat yang menyulam segala halnya menjadi sebuah proses: membuat desain, pencetakan, penjahitan, pengukiran, pemotongan, dan penjahitan kembali. Sementara Dina bertugas untuk promosi online, penjualan, dan pemasaran; menciptakan kepribadian atau identitas untuk merk, dan menulis blog. Deskripsi pekerjaannya termasuk membuat humor garing dengan kejanggalan yang unyu. Elia memaparkan bahwa Dina menulis “tatapan aneh” sebagai penutupan karena sebagai orang yang kuper, Dina mempunyai kebiasaan menatap dengan aneh pada para orang asing yang membuat orang yang bertemu dengannya pertama kali akan merasa janggal. Bagaimana pun juga, pengetahuan tentang hal detil ini membuktikan bahwa keakraban dan kemistrilah yang membuat keduanya sebagai sepasang sahabat; atau lebih persisnya seperti kakak-adik. Persaudaraan yang berlanjut; terjalin bersamaan dengan jarum, kain, pola, sentuhan, wewangian, gosip, dan segala rasa. Produk Simalakamma beriringan dengan sebuah petualangan panjang dari karya tangan halus dan desain yang kreatif. Sebagian besar proses dan di balik layar Simalakamma dapat dirunut dalam pameran ini. Ketika Anda masuk, anda akan dipandu dalam perjalanan ini, mulai dari pendesainan, pencetakan gambar, penyulaman, pengukiran dengan laser, pemotongan, dan penjahitan sebelum produk dapat dipublikasikan pada akhirnya. Si para gadis Simalakamma memahami setiap orang dengan hatinya. Hubungan mereka dengan si ‘para agen makna’ begitu dekat dan personal, sedikit detail pada kehidupannya. Ambil saja lingkaran sulaman sebagai contohnya: proses bordir lebih dari sekadar pekerjaan bagi mereka. Bagi sekelompok murid sekolah seni yang membantu pembuatan pola rumit pada bordir, lingkaran jahitan adalah cara mereka untuk mendapatkan uang tambahan bersamaan dengan tertawa dan saling berbagi cerita kehidupan. Bagi wanita yang baru saja kehilangan suami, mengerjakan Simalakamma adalah tentang cara terapi dan membantunya bangkit sekali lagi. Dan bagi pekerja jahitan melingkar, proses bordir diperhitungkan sebagai relaksasi, bergosip, dan sangat membuat ketagihan. Elia paham akan apa yang akan dilakukan para agen dengan pola, entah dia akan memberikan warna gelap kepada kelompok yang lebih muda atau yang lebih tua akan lebih menyukainya. Dia juga tahu bagaimana mengatasi intimidasi Ibu mertua pada jahitan kaku lelaki yang sangat komitmen pada pekerjaannya. Hal itu mengalir begitu saja pada Elia secara alamiah untuk memahami setiap orang dengan hati karena dia menghabiskan kesehariannya dengan mengunjungi mereka sesaat setelah waktu minum kopi dan mencari inspirasi online-nya; sesaat sebelum proses desain dan favorit pekerjaanny: memadu-madankan kain. Bagi saya, hal ini begitu penting untuk memperhatikan fakta dan kisah proses untuk mampu mengatakan ini: Simalakamma lebih dari sekadar produk atau merk dari tas buatan tangan. Ia adalah sebuah karya seni dicampur dengan kisah yang mempesona dan menyentuh rasa, merajutnya bersama dalam setiap tusukan jarum. Nama Simalakamma dipilih berkaitan dengan kata asli yang tidak diketahui artinya. Ia bukanlah bagian dari suatu bahasa meskipun terdengar familiar. Artinya pun diperhitungkan aneh dan mewakili sebuah pilihan yang aneh pula. Kelihatannya seperti sesuatu tentang keunikan bahwa si para gadis Simalakamma terkesan menarik. Tentu saya, pada poin ini, apa yang mereka sebut sebagai janggal saya artikan sebagai keunikan. Saat pertama kali, produk mereka adalah jelmaan konsep memperindah gaun jadul yang tak terpakai dengan pola menarik yang mereka temukan pada toko hemat. Kemudian ia berkembang kepada bahan-bahan baru dan lebih banyak produk lainnya seperti tas, dompet, kantong, tas jinjing, kantong iPad, kantong passport, dan bahkan pembatas buku. Mereka memilih untuk membuat aksesori jenis ini karena keterkejutan dengan desain yang dapat ditawarkan (contohnya: kantong kartu SIM mini di dalam sebuah tas), dan karena Elia jatuh hati dengan teknik bordir dengan tangan dan peluang aplikasinya adalah pada sesuatu yang tidak seharusnya sering dicuci untuk menjaga penampilannya yang cantik. Dalam penciptaan produk ini, Simalakamma terinspirasi dengan segala hal yang cantik. Warna-warna, pola-pola kain, barang-barang melankolis, buku-buku, produk pakaian, dan hal-hal yang dapat dilihat di jalan. Bagi mereka, menjadi Simalakamma adalah seperti menjalin hubungan. Tentu saja, tidak ada hal lain selain cinta yang dapat membuat Elia sangat bahagia hanya dengan melihat setumpuk kain dan jarum di studionya, benarkan? Pada pameran ini kami ingin membawa Anda ke dalam petualangan sebuah tas dompet. Di sini Anda dapat menyaksikan proses keindahan dari selembar kulit dan kain dijahit bersamaan sebagai suatu karya seni unik yang dapat dipakai. Pameran ini merupakan kolaborasi antara Simalakama dan para agen makna dengan seorang fotografer, Dito Yuwono. Kedua karya seni dan pameran adalah produk dari karya seniman dan dedikasi yang baik. Selamat menikmati pertunjukan dan seperti yang dikatakan Dina, jangan lupa untuk bernapas dan sesekali tertawa!